Here we come Eagle River, WI! Heaven on Earth. This past week we had the opportunity to head up north to our family’s lake house in Eagle River to celebrate the fourth of July. Totally spontaneous because nobody was using the lake house and Mark happened to be off work (he might of told me last year when he picked his vacation). The boys had baseball on Monday (God forbid they skip a game) so the plan was to head out Tuesday morning. Well, you already know that it’s never that simple. I’m not able to do that since I need to be available during business hours. So after a little time management and convincing Maddi that it was going to be fun, I decided to head up with my girls last Sunday and work remote (ideal since I need focus and spend most of my days on calls with candidates). My Mark had it all figured out too, his Dad was going to drive me with the girls. Wait, huh? WHAT?! I don’t need anyone to drive me! Don’t get me wrong I’m thrilled to spend time with Papa, my father-in-law, but I certainly don’t need a chauffeur, chaperone or bodyguard. Why is that so aggravating? Not sure. The intention is so super sweet but it totally irked me. Plus I love a challenge and yearn to try new things that lead to a sense of accomplishment! And driving up North solo with my girls is exactly what I need to take my mind off life. 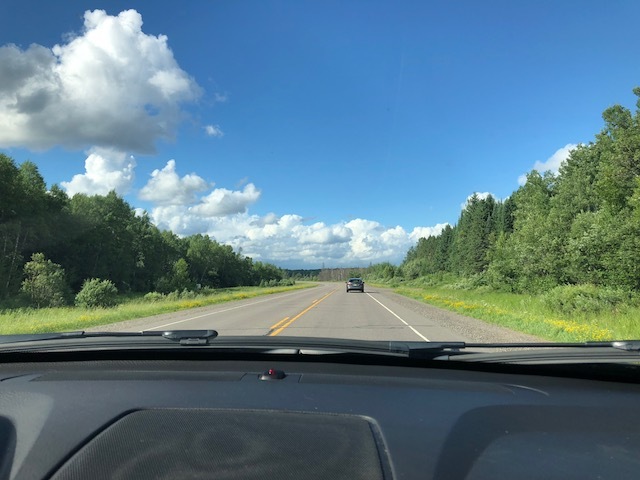 In the 20 plus years that I’ve been coming up North with Mark’s family, I’ve never driven alone. Let’s do this! ROAD TRIP! My little ladies and I hit the road on Sunday morning. As soon as we left, I knew in my heart and soul that this was going to be a spiritual Sunday that I would never forget. Our very first girls trip! Was I nervous driving for a six hours with storms on the horizon – yep but I just let it be. We sang, we talked, we daydreamed and for the first road trip ever, we had elbow room and the car smelled so good (without the dog and boys). We were free to do whatever we wanted, stop whenever we felt like and listen to all the trashy music our hearts desired! Mark is more of a talk radio, podcast kind of guy (shoot me now) with the exclusion of Red Hot Chili Peppers, the Pulp Fiction Sound Trek and Beastie Boys. During the drive there were some great discoveries (what it was like when I was a teenager, how me and Mark met, some sacred family business that we won’t share and new secrets for me and my girls) but some discoveries need to be shared and for all the world to know. For example, we all agree that Beyonce is absolutely not overrated … she really is all that and then some. She has soul and can sing like the greats. Amen! And we talked (and laughed) extensively about the the type of girls that Mark and Jeffrey will marry. And Maddi is looking more forward to Mark’s wedding because it will be low pressure. She kills me! 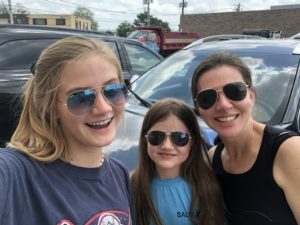 When driving you are not looking each other in the eye so there are no inhibitions and nothing is off limits … a great way to connect with your teenagers. If you have the chance, take a long drive, look straight ahead and get to know each other. When we arrived, we had to open the house … I found a dead mouse in a sticky trap in the basement (God help me now), I took a deep breathe turned the water on then closed and locked the basement door (won’t open or go down until Mark is here) and I also set off the alarm three times. I’m setting the alarm. I’m a true city girl and the forest animals scare me way more than any hoodlum (in the city there are people everywhere to help). Here, we are alone in the woods! 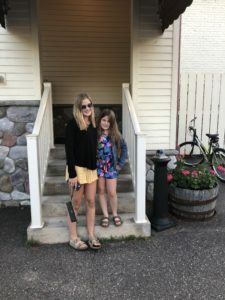 This road trip and the two days alone with my girls provided time to slow down, reflect and simply think things through. For me, everything has to have a meaning, a purpose and every decision needs to be valid. I was able to clear my head and share my immediate and long goals with my 15 year old daughter. Her perspective was invaluable and I intend to listen to her advice. I’m going to “dial it back”, be grateful, concentrate on my family and simply enjoy what the next year brings. The boys arrived and everything was louder, messier, safer and exactly what we need; a little chaos added to our zen. I’ve been trying to write this since last Sunday night at 7 p.m., completed on Tuesday, July 3 at 10 p.m. and finally able to post today (back home after 4th on the lake and then WI Dells for a baseball tournament). I won’t get into all the interruptions but the most special was about calamine lotion. Allison: Do we have calamine lotion. Me: Yep. Allison: I wish there were no mosquitoes in WI (she says Misconsin). She pauses, wait that would be a waste of a wish. I know, I know my wish … I wish Gramma would come back. Do you float to heaven? Me: Oh Sweet Allison, me too. And yep, I imagine we’ll float. Next Post >> Put Your Hands Up!